This is Michael Lortz’ fifth and final piece as part of his June residency at FanGraphs. Lortz covers the Tampa Bay baseball market for the appropriately named Tampa Bay Baseball Market and has previously published work in the Community pages, as well. You can find him on Twitter, as well. Read the work of all our residents here. During my month here at FanGraphs, I’ve given an overview of the Rays’ attendance problems, detailed their need to attract millennials, compared them to other small-market teams, and discussed how their marketing strategy differs from local minor-league competition. Today, I want to end my time as June resident by talking about how baseball attendance in Tampa Bay will fare in the second half of 2017. On June 24th, the Rays played their 41st game at Tropicana Field this year. Their average attendance at that point was 14,930. 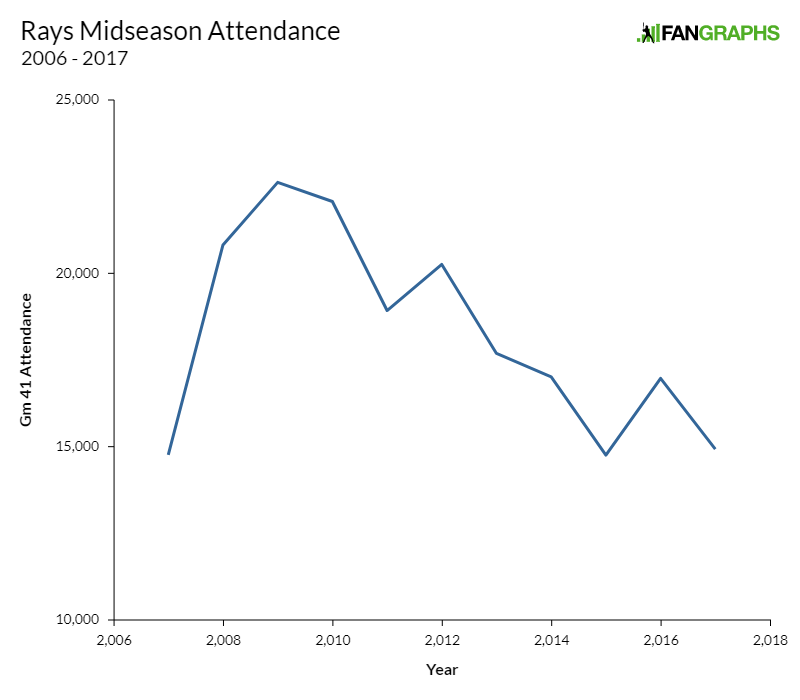 Of course, this is the lowest average attendance of any team in the Major Leagues, but it is also the Rays’ third-lowest midseason average attendance since 2007. Only in 2007 (when they were still the Devil Rays) and 2015 (the first post-Maddon year) was average attendance lower at the halfway point. The following graph depicts Rays’ average attendance at Game 41 since 2007. The following table shows how much the Rays’ final attendance differs from midseason attendance. Since 2007, only three times has attendance declined in the second half of the season. If we explore attendance on weekends and weekdays, we may be able to discover fan behavior. Since 2007, weekday attendance in the second half of the season typically increases, with the only exceptions being 2016. A quick guess as to why weekday attendance increases in the second half? Because parents don’t have to worry about getting kids back to bed on a school night. So the Rays may see more families attend on weekdays in the second half. While weekday attendance tends to increase, weekend attendance is much more up and down. Let’s look beyond days of the week, to time of year. The following chart depicts average attendance by month. We know attendance will increase in the summer. That’s as close to a rule as we have. But determining what month had the largest increase can identify trends and patterns. We see average attendance in July, August, and September is more than average attendance in May and June. Again, probably because of school being out and the possibility of meaningful games in the end of the year. Can these charts help us predict Rays attendance for the rest of 2017? The club’s attendance is driven largely by day of the week, level of play, and opponents. So far, the Rays are a few games over .500 and may be in contention for a Wild Card, especially if their bullpen can straighten out. The Rays’ average attendance in September increases 29% if the team is in contention. The Rays were in contention in 2008, 2010, 2011, and 2013. They were not in contention in 2007, 2009, 2012, and 2014-2016. The schedule might also indicate an increase in attendance. The Rays have yet to play the Red Sox in Tropicana Field, and although average attendance against the Red Sox has decreased in recent years, they still draw above-average crowds. The Rays also have three games remaining against the Yankees, who could see a resurgence in attendance if Aaron Judge continues his hot hitting. Lastly, the Rays host the Chicago Cubs in late September. Not only will local Chicago transplants see their World Series champs, but the series also marks the return of Joe Maddon to Tropicana Field. I wouldn’t be surprised to see a 5-10% increase in average attendance the second half. Unfortunately, even with a 10% increase – and that is a good increase – the Rays will still finish below 1.3 million in total attendance in 2017. Of course, the Rays aren’t the only game in town. Local minor-lague teams play 70 games a season. These teams also ebb and flow by month. April and May tend to be better months for the minor-league parks, as the Florida summer hasn’t yet set in, the humidity isn’t overbearing, and seeing an outside baseball game is an enjoyable experience. By the time mid-June arrives, however, summer heat brings evening showers that put a damper on outdoor baseball attendance. The following chart shows the average midseason minor-league attendance for each team in Tampa Bay. The Clearwater Threshers are averaging greater crowds they have since 2009. 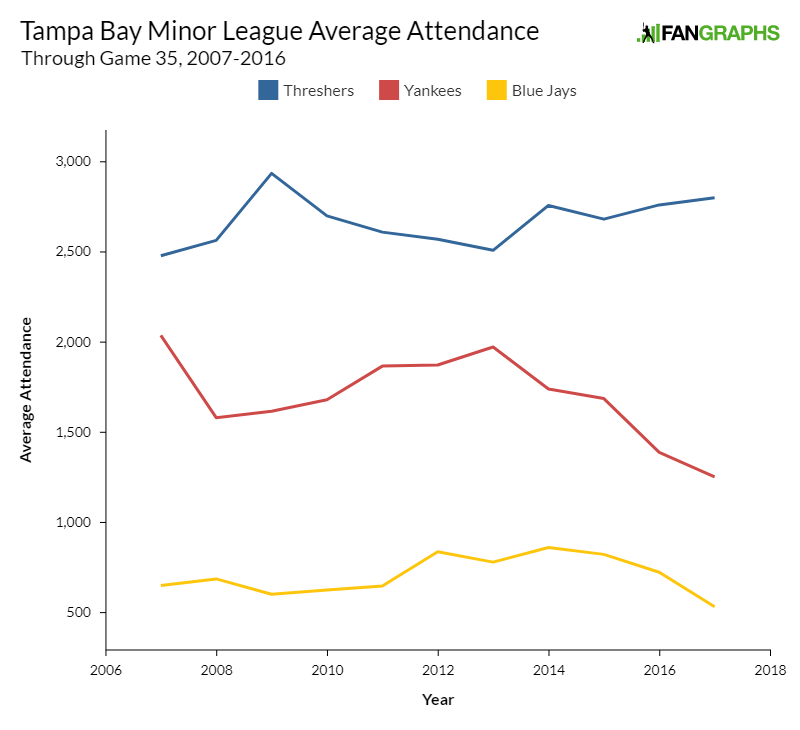 Meanwhile, the Dunedin Blue Jays and Tampa Yankees have both seen their lowest first-half-attendance marks in over 10 years. In Bradenton, the Marauders have seen their lowest first-half average attendance since 2010. Overall, minor-league attendance usually decreases in summer months, with the exception of Clearwater since 2013. However, two events should increase local minor-league attendance. First, this weekend’s upcoming Independence Day fireworks extravaganzas. As I have mentioned before, people love fireworks. On July 4th, they are even willing to tolerate the Florida heat and humidity. The second event that should boost Tampa Bay area minor-league attendance is the arrival of Tim Tebow. Tebow is scheduled to play the Tampa Yankees and the Clearwater Threshers in the second week in August. There are many University of Florida fans who will no doubt buy a ticket to see their former quarterback. If the Threshers can maintain their average attendance through the summer, with their upcoming fireworks shows and the arrival of Tebow, they could make a run at the Florida State League single-season attendance record. As a reminder, here is a chart of the closest minor-league teams to major-league teams. Overall, attendance in the Tampa Bay baseball market should increase in the second half of the season. The Rays, Threshers, and Yankees should see increases, while the Jays and Marauders should maintain or see slight decreases due to weather. For the last 11 years, professional baseball in Tampa Bay has drawn over two million fans. Some of these fans have come as tourists for spring training, but most have been locals. This year, Tampa Bay baseball might not reach 2 million. The World Baseball Classic zapped spring training of some of its biggest draws, the Rays aren’t drawing like they used to, and local minor-league baseball – with the exception of the Threshers – is on the decline. As I have pointed out, the market for baseball dollars, hearts, and minds is saturated in Tampa Bay. There are more professional baseball games played in the area than any other area in America. And even if we estimate a total without the tourists, even with the decreases, combined Tampa Bay attendance is still average for a small market. The Rays are unlikely ever to have a monopoly of Tampa Bay baseball interest. Too much money and political interest is invested in alternative baseball options. They won’t get a new stadium in the next three years, perhaps even five years. And they won’t be able to claim territorial rights until Major League Baseball includes spring training in Rule 52, which probably won’t happen because it would cost the Yankees, Phillies, Blue Jays, and Pirates too much money to move. But at least more people will see Rays baseball in the second half of 2017. We hoped you liked reading Tampa Bay’s Second-Half Attendance by Michael Lortz! Good work, Michael. Also, if you included spring training in territorial rights there would be 14 teams opposed because of Phoenix. The March tourism economy of Phoenix as well as Tampa-St. Pete would collapse. So I think it’s safe to say it will never happen.